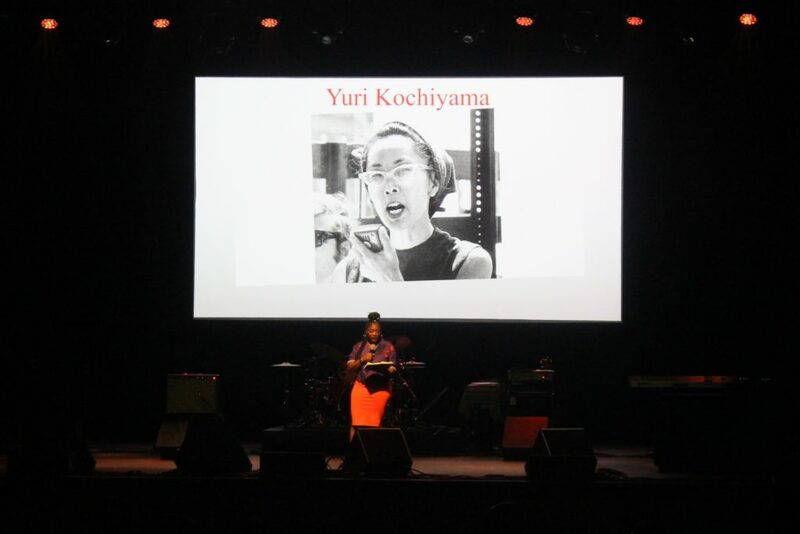 It was at the moment that Yuri Kochiyama’s daughter was accepting the award for her mother, presented by Alicia Garza, co-founder of Black Lives Matter. 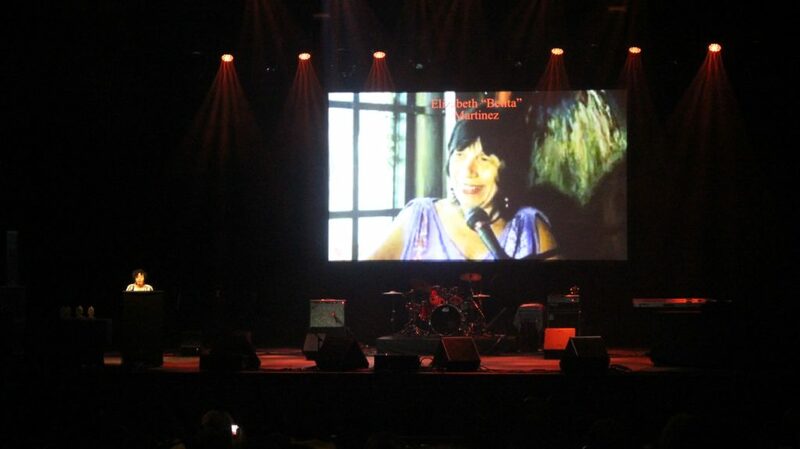 Images of Yuri were projected on the screen behind the stage, one of which was the photo of Yuri holding a bleeding Malcolm X in her arms in his last moment’s earth side after he had been shot. Yuri’s daughter spoke to Garza and told her how proud Yuri would have been of her and the Black Lives Matter Movement. It was at that moment that my eyes began to water and tears rolled down my cheeks. “The aftermath of nonviolence is the creation of a Beloved Community,” said Dr. Martin Luther King. 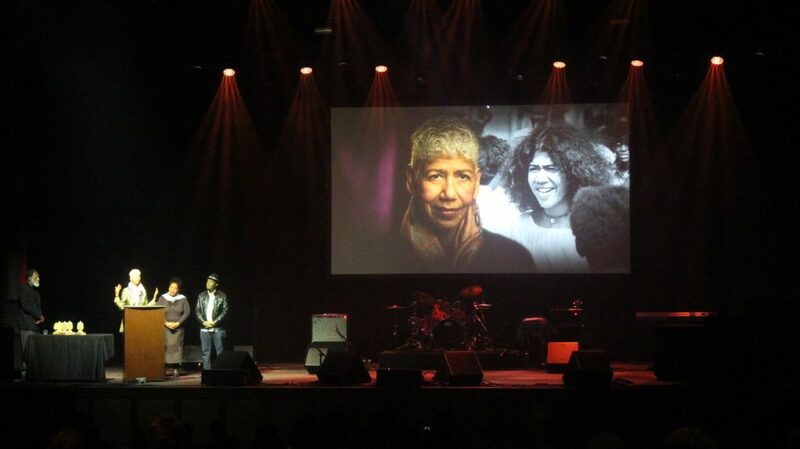 Oakland you are so dear and so beloved; Beloved Oakland, celebrated on February 18, was truly a beautiful event. It was a fundraiser for the Black Culture Zone that East Side Arts Alliance, community members and local activists have been planning. Even prior to entering the building, as I drove past in a parking spot hunt, I saw vibrant colors, African prints, long skirts and dapper suits huddled in front of the bright FOX Theater Oakland sign. The historic building, constructed in 1928, was buzzing; old school organizers from different movements, young people from Destiny Arts who would later perform, and everyone in between. As folks shuffled in greeting one another, the Afro- Eclectic combo band Elephantine was jamming on stage with a tribute song to Oakland. “Never Never gonna let you go no no,” band members sang to our beloved city. Ise Lyfe took the stage and proudly introduced himself as being from East Oakland. Folks cheered as he and Nicole Lee of the Urban Peace Movement MC’d, preparing us for a powerful night. When I tell you that this event was shape shifting, I tell no lies. Ericka Huggins took the stage with Emory Douglas representing the Black Panther Party’s Oakland Community School in accepting the Oakland’s Iconic Warriors for Justice award. “This is a precedent- setting city for over 100 years.,” Huggins said. “I mean the Panthers started here, the Panthers became famous!” She laughed in almost disbelief. “Thank you East Side, thank you. Just thank you.” Huggins spoke to the fact of how remarkable it was to be standing on that stage, to be alive, to not be incarcerated, to not have gone crazy. 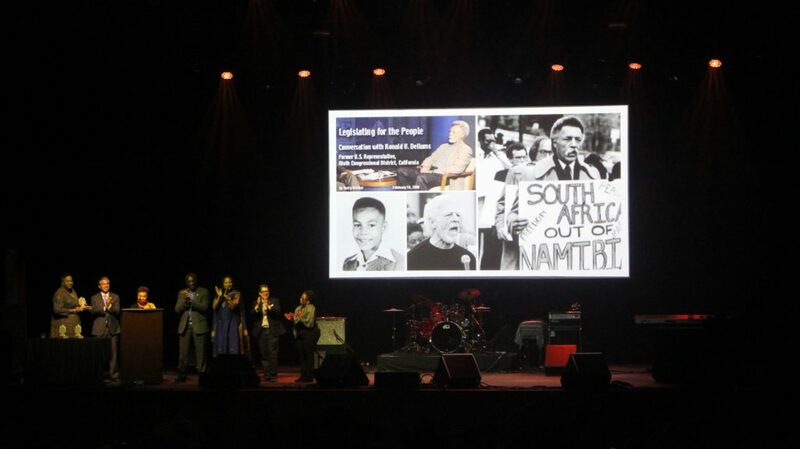 She recognized the Party activists who could not be there because they are locked up, dead or living in exile. 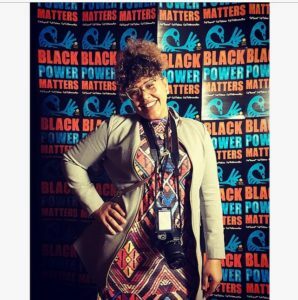 Elena Serrano of East Side Arts Alliance led the Call to Action and greeted us all with “Happy Black Future Month!” an undoubtedly catchy concept that makes perfect sense with this weekend’s release of the movie Black Panther and all the Afro-Futurist energy buzzing through the streets. Serrano was joined by John Jones, an East Oakland native and community justice advocate, Margaretta Lin of the Dellums Institute for Social Justice and Darrell Jones of Tech Equity. They all lined up on stage and each spoke to the Action that must be taken now, today, yesterday to address and fight Oakland’s racial displacement crisis. The call to action has a core element in the fight against Oakland’s racial displacement – the East Oakland Black Culture Zone (BCZ). The leaders of the Black Culture Zone have been working tirelessly; the BCZ has grown out of a vision of a neighborhood that is proud to be Black. The Black Culture zone will support Black- run business, promote healthy choices and lifestyles, offer education of true stories and legacies to our youth and lift up Black cultural traditions. The leaders are proposing that the old Safeway building on International and 57th Avenue serve as the hub for the BCZ. In an Oakland once known as Chocolate city yet loosing it’s Black population by forced economic displacement at a rapid rate, a Black Culture Zone holds the promise that the legacy of Oakland’s vibrant music, art, dance, politics, intellect that is Black Culture, will remain alive and free. “Culture is the essence of life, and everyone needs to know their essence,” was the message in the video introducing the BCZ. 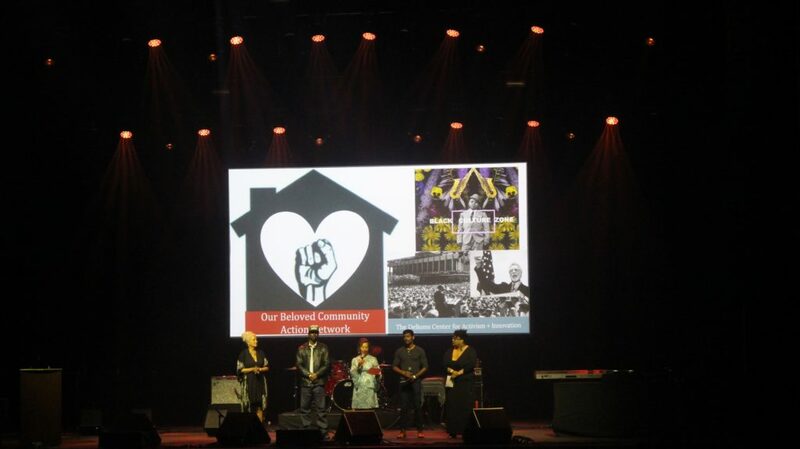 You can still donate and support the creation of the BCZ at https://www.belovedoakland.org/action/. The event had six different categories of sponsors, ranging from catalyst ($10,000 sponsorship) to advocate ($250 sponsorship.) At one point Ise Lyfe pointed out the importance of having such sponsorship to stand by the movement. Oakland is no doubt a beloved city, a beloved community and a fierce fertile ground of creative brilliance and social justice icons. This should be an annual event. It was a reminder of all the work that has been done, continues to be done and is to come, that was and will be birthed in this beautiful city.